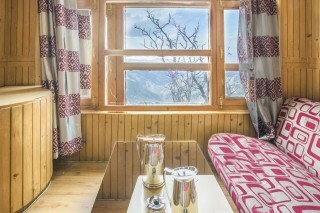 This is an offering of a private room in a guest house located just 400 m away from The Ridge. 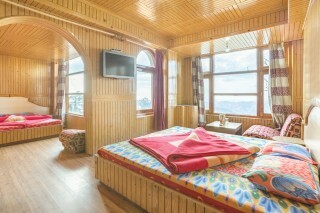 The room on offer is spacious and can accommodate up to five people. This offering is ideal for a family or a group of friends. Your Space This guest house is surrounded by lush greenery and tall trees, and offers a pretty view of the picturesque valley. Inside, the front desk sets the theme for the establishment. It flaunts wood-panelled interiors, which add a touch of warmth to the abode. The room on offer has two individual spaces, each furnished with a comfy double bed. The room boasts wood-panelled interiors that lend it a rather homely charm. Plush chairs, coffee tables, a dressing table, and a compact wardrobe are present for your convenience. A wall-mounted television is set up to ensure that you do not miss out on your favourite shows even while on a vacation. Ample windows ensure sufficient daylight and adequate ventilation in the room. The en suite bathroom is well appointed with modern fixtures and western sanitary ware. Guest Access Feel free to spend leisurely time in the common areas of the property when you are not in your room. Guest Interaction Feel free to reach out to the staff or the caretaker present in case you need any assistance. Neighbourhood Overview Christ Church is located 290 m from the property. These are some of the other attractions nearby that guests can explore: The Mall - 1.8 km Jakhu Temple - 1.3 km The Ridge - 400 m Kufri - 14.3 km Getting Around The property is located 9.7 km from Shimla Bus Stand, 6.7 km from Shimla Railway Station, and 24.9 km from Shimla Airport. Additional Information Guests are required to provide valid identification at the time of check-in. We do not host groups of bachelors. Any inconvenience this may cause is regretted. Rooms were fine , but we booked for 6 people and we were been told that the price we paid is for 6 people but when we reached there the host said that she is just for us accomodating 6 people , although she was nice and helpful, property was clean and was also near o the market area , so overall it was a nice trip. The place is really pleasant, from the environs, to the bedroom we stayed in, to the comfort we experienced. We absolutely loved it and it met our all our expectations of giving us a home away from home! We had booked the guest house online. Its a nice place located bit far from the crowd. Found it to be good with full value for the money.